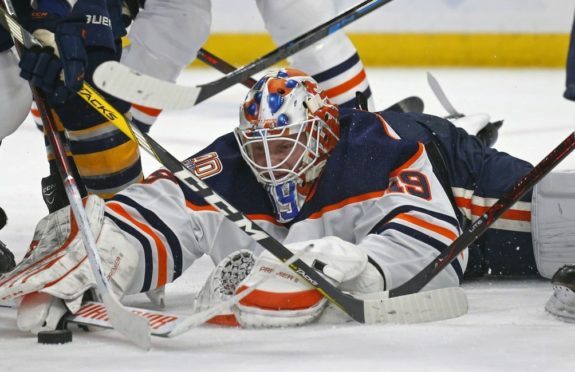 CALGARY — The Edmonton Oilers believe they received relatively good news after Connor McDavid left Saturday’s season finale with a leg injury. After a 3-1 win over the Calgary Flames, the Oilers said X-rays on McDavid’s left leg came back negative. He was scheduled to return to Edmonton on Saturday before having an MRI. “He had a lot of people looking at him and so far, so good … (The) MRI tells you everything,” Oilers coach Ken Hitchcock said. The Oilers star was hurt early in the second period. Darting down the wing, McDavid had his feet knocked out from under him as he tried to cut hard around defenceman Mark Giordano. The Oilers captain slid hard into the goal post, his left leg taking the full brunt of the impact. He remained down for a few minutes before being helped off the ice by teammate Zack Kassian and a trainer, while putting no weight on his left leg. Giordano was penalized for tripping on the play. Leon Draisaitl, with his 50th goal, Alex Chiasson and Darnell Nurse scored for the Oilers (35-38-9), who were eliminated from playoff contention for the 12th time in 13 years earlier this week. Calgary will face the Colorado Avalanche in the first round. The Flames will have home-ice advantage for the first time since 2006. McDavid finished second in NHL scoring, 12 points back of Tampa Bay’s Nikita Kucherov. McDavid’s 41 goals equalled his career-best and his 116 points is a career high. Oilers goalie Mikko Koskinen made 30 stops. Edmonton opened the scoring at 10:55 of the first period when Andrej Sekera pinched down the sideboards and got the puck to Draisaitl near the faceoff dot. He wristed a shot past Smith for his 50th. Draisaitl is the first Oiler to reach 50 goals since Wayne Gretzky and Jari Kurri each did it in 1986-87. Calgary drew even five minutes later when Jankowski deflected Travis Hamonic’s shot past Koskinen. Johnny Gaudreau had the second assist to get him to 99 points. Gaudreau would fall one point shy of becoming the first Flame since Theoren Fleury in 1992-93 to record 100 points in a season. Nurse gave the Oilers some breathing room 5:21 into the third, holding the puck patiently on a two-on-one before firing a shot past Smith high on the glove side. NOTES: Calgary scratches included Sean Monahan, Sam Bennett and Matthew Tkachuk. All three are expected to be in the lineup for the playoff opener. … Calgary finishes with 107 points, which is the second-highest total in franchise history, behind only the 1988-89 Flames, who had 117 points and went on to win the organization’s only Stanley Cup.